There is this music called anti-folk. The people who came up with the label don’t believe that they are making folk music. Folk music, they say, presents the lives of rural people, farmers and the like. It presents a sense of community, and espouses values like friendship and peace. Anti-folk, on the other hand, is urban music. Cities are overcrowded, and the music reflects a desire to find a little patch of space they can call their own. Anti-folk artists do not make pretty music either; their art reflects the harshness of their environment. And that, for me, is where their argument falls down. Their music reflects the ways in which people respond to their environment. That is what folk music does. The function of the music is not that different; just the environment is. And, by now, Anti-folk has been around long enough to develop its own traditions. Enter Lisa Jaeggi. I found a reference to her as an anti-folk artist. I’m not sure she would use the label herself. She lives in Brooklyn NY, where you can walk a block and hear music from many cultures. And that background finds its way into her music in many ways. I’m not sure Jaeggi is even aware of all of them herself. Many of her songs are based around repeating guitar patterns. This reminds me of some African music I have heard. Jaeggi’s words often come out in torrents. This is reminiscent of Jason Mraz’s first album, but also happens in rap. And, being exposed to such a diversity of musics, Jaeggi feels free to use whatever elements she pleases to color her music. So, most of her songs have just guitar, stand up bass, and maybe simple percussion, but sometimes she adds glockenspiel or vibraphone. I mentioned that Jaeggi uses repeating guitar patterns in many of her songs, and it would be tempting to say that she is limited as a guitar player. But, in the course of the album’s nine songs, Jaeggi demonstrates a range of different techniques and moods in her playing. And she also must keep the beat mostly with her guitar; the percussion parts, when there are any, are more for color. 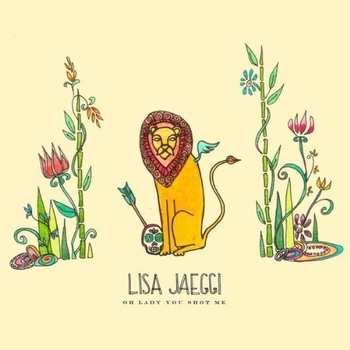 Lisa Jaeggi’s lyrics reflect a world in which real love is hard to find. Relationships are fleeting, and dishonesty is everywhere. But Jaeggi doesn’t give up. Heartache is the last song on the album, and it is a pledge of love. The song ends the album on hopeful note. Before we get there, Jaeggi expresses the search for love beautifully in The Place. There are songs here about breakups. And there are the kind of songs that cause arguments. What is this song about? It depends not only on the songwriter but also the listener. Jaeggi weaves a web of words. It is up to the listener to step back and discern the shape of that web. This kind of writing can seem pretentious or even precious, but that never happens here. Somebody is one of these songs. I hear a song about an artist whose work is passed over in favor of the work of more commercial artists; The narrator says she gets his work, and offers her love. That’s what I hear, but you may take away something completely different. I should mention that Oh Lady I Shot You contains strong language. Readers should decide their own comfort level before playing this album in the presence of children. The strong language is not overdone, and suit’s the characters. So I find Lisa Jaeggi to be a fine writer. The music is made by only two musicians on this, Jaeggi’s debut album. I can hear extra parts in my head as I listen to this, and I will be very interested in whether Jaeggi chooses to expand her sound in the future. I hope to share that with you in the future.